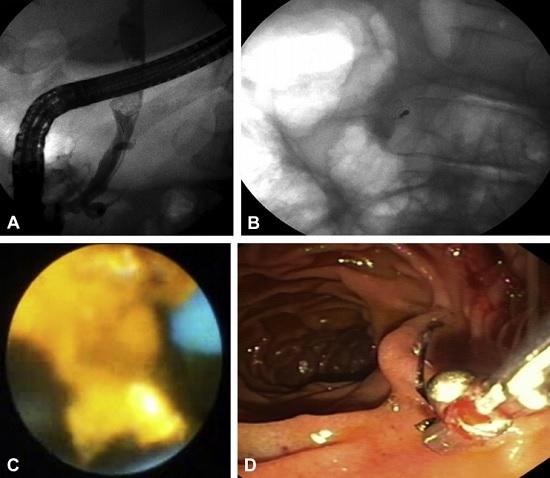 An 80-year-old female diagnosed with a large common bile duct (CBD) stone (2.2 X 1.5 cm) underwent ERCP and failed attempt at stone extraction using a balloon. A temporary biliary stent was inserted and she was referred to us for further management. She underwent repeat ERCP at our center, one month after the index ERCP. In view of large stone and relatively small diameter (~ 9 mm) of CBD distal to stone, she was subjected to CRE balloon (Boston Scientific, USA) sphincteroplasty of the papilla till 12mms. Stone extraction was attempted with stone extraction basket; however the basket got impacted in the lower CBD due to narrower bile duct distal to the stone. A Soehendra-type rescue lithotripter was used over the sheath of the impacted basket to crush the stone. During lithotripsy, the wires of the basket got fractured with partially fragmented stone and the fractured part of the basket with its metal tip now lying within the bile duct. A terumo guide wire (0.032”) could not past the impacted stone. Spyglass (Boston Scientific, USA) cholangioscopy-guided Holmium laser lithotripsy was then performed and the impacted stone was fragmented. The fractured basket and the stone fragments were then extracted using rat tooth forceps and stone extraction balloon, respectively. Our patient had a large bile duct stone with relative inflammatory narrowing of the terminal bile duct. By definition it is classified as a “difficult bile duct stone” in view of stone to duct size discrepancy. After doing large balloon sphincteroplasty we anticipated that the stone could be extracted using a basket, however it got impacted. Even though the traditional and time tested Soehendra “rescue” lithotripsy was attempted, unfortunately the basket got fractured within the bile duct. Figure 1. A, Cholangiogram showing single large stone in mid CBD with presence of relative narrowing of the terminal bile duct. B, Residual fractured basket with metal tip lying within the bile duct. C, Cholangioscopy guided laser lithotripsy being done. D, Extracted fractured basket from the bile duct using rat tooth forceps. This case highlights how to overcome an on table emergency situation. As the impacted stone didn’t allow passage of a guide wire, placing a stent was also difficult to tide over the crisis. The patient would have required emergency percutaneous or surgical drainage procedure to avoid cholagitis. Thanks to availability of cholangioscopy, laser lithotripsy could be done and the crisis could be tide over successfully. It is very important to obtain a good cholangiogram with special focus on the size and anatomy of the terminal bile duct in patients with large/difficult bile duct stone prior to attempting stone extraction. Avoid judgement of error. Whenever in doubt, always using balloon instead of basket for stone extraction as the basket can get potentially impacted within the bile duct. If at all you use a basket for stone extraction in patient having large bile duct stone or patient having stone to duct size discrepancy, it should always be a lithotripsy compatible basket (Trapezoid basket, Boston Scientific USA or BML 3Q, Olympus, Japan). The endoscopist should be well versed with various other “rescue lithotripsy” techniques whenever he is managing a patient with large (difficult) bile duct stone. Proper pre-planning is of utmost importance prior to attempting ERCP in such cases. Be ready with a “Plan B” if at you fail in executing the primary option. If the endoscopist is not confident or does not have access to advanced lithotripsy techniques, the threshold to refer the patient to higher center should be very low. If the patient has gall bladder in situ and is due for cholecystectomy, ask help from your surgical colleagues as they can remove the large bile duct after doing a small choledocholithotomy in the same sitting.